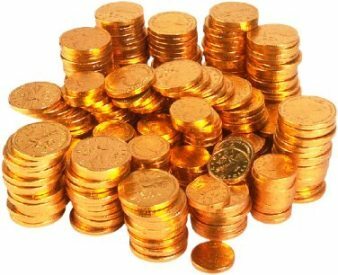 There are a lot of gold coins available on the market. First, lets explain some fundamental differences between them. Also known as Collector Coins, rather then the actual Gold content in them, the value of a numismatic gold coin is determined by several factors: its rarity, the number of coins originally minted, and the age and condition of the coin. Numismatic coins are bought and sold within the coin collecting community with little regard for today's spot gold price. Numismatic coins are cherished for their beauty, historical significance, and their potential investment value. Hence, numismatic coins sell at a significant premium over their intrinsic gold content. The term semi-numismatic coins means those that are semi-collectible. These coins contain precious metals that generally move up and down with the spot price of the precious metals but also contain additional value above their precious metal content. The term "semi-numismatic gold" usually refers to circulated United States gold coins struck prior to 1934 that carry a relatively small premium over their melt value. These coins fall more into the "common" category than the "rare" category. There is a premium for these coins based upon such factors as demand. Semi-numismatic coins are the happy medium between graded Numismatic coins which carries a high premium above the market spot price and the Bullion coin which carries the lowest premium above the spot market price. Bullion may come in bar or coin form. Its value is principally based upon its precious metal content plus the cost of fabrication. The value of a bullion bar or gold coin prices rises and falls with the spot price of the precious metal. Most gold bullion coins, issued around the world, are denominated in troy ounces and are normally issued in 4 sizes, containing specified weights of fine gold: 1-oz, 1/2-oz, 1/4-oz, 1/10-oz. The 1-oz gold bullion coins have the lowest premium over spot gold price. The gold purities of gold bullion coins vary; they can contain 99.99%, 99.9%, 91.67% or 90% of pure gold. When buying gold coins for an investment, these are the ones to purchase. All can be purchased from this reputable source. Below are the details of each coin. First introduced in 1986, the American Eagle gold coin is is one of the freest trading and leading gold bullion coin choice among investors across the world. The American Gold Eagle is considered legal tender in the United States with a face value of $50 though the intrinsic value of its gold content is much higher. These bullion coins are traded based on the market value for gold. 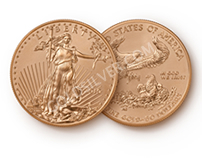 American Eagle coins are minted exclusively from gold mined in the United States. The coins combine 24-karat gold with small amounts of alloy to ensure a minimum of scratching and marring; the result is a 22-karat gold coin. The Canadian Maple Leaf Gold Coin is one of the most recognizable coins in the world they are especially sought after in North America and is is the official bullion gold coin of Canada produced by the Royal Canadian Mint. Due to its 99.99% gold purity, the Royal Canadian Mint markets its gold Maple Leaf coin as the "international symbol of purity." The gold Maple Leaf has been produced since 1979 (it was minted with 0.999 fine gold for the first four years before increasing the gold content to 0.9999 fine in 1983). 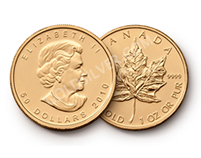 The Canadian Maple Leaf Gold Coin is considered legal tender in Canada with a face value of 50 Canadian dollars. The Gold Maple Leaf Coin is backed by the Canadian government. The front, or "obverse," of the gold Maple Leaf features a bust of Queen Elizabeth II. Originally, the bust depicted the Queen as a younger woman. The bust design changed in 1990 to feature a more mature portrait. In both versions, "ELIZABETH II" appears above the portrait; the coin's face value and date of issue rest beneath the bust. The back, or "reverse," depicts a Maple Leaf, the national symbol of Canada for which the coin derives its name. The gold Maple Leaf's reverse also lists the name of the country and the amount and purity of the gold - in both English and French, the national languages of Canada. The world's first gold bullion coin minted for investment, the Krugerrand is believed to be the most widely owned bullion coin in the world. It is extremely liquid and easy to trade internationally. 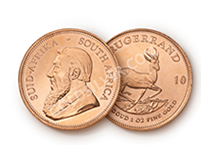 The Krugerrand was first introduced in 1967, as a vehicle designed to encourage individuals to own gold. The Krugerrand's obverse (front), designed by O. Schultz, features the first President of the South African Republic, Paul Kruger. Each Krugerrand is minted using approximately 91 2/3 parts gold and 8 1/3 parts copper and has a 22 Karat purity giving it a more durable surface. Struck by the Austrian Mint in the mid-1990s, Philharmonics were among the best selling gold bullion coins in the world. The obverse (front) depicts the great organ in the Golden Hall in Vienna's Musikverein Concert Hall, the home of the Vienna Philharmonic Orchestra. 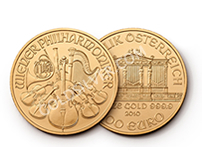 The Philharmonic Gold Coin can be used in legal contracts with a 100 Euro face value. The coin has 24 karat purity and is .9999 fine gold purity content. OK, next question you probably want answered, what resource for purchasing gold coins do you recommend? Return From "Gold Coins" to the Home Page: "Stock Market For Beginners"